This idea took about 4 years from idea to delivery, but at last, it is with great joy that I announce that the pairing of TinkerTry and Wiredzone has resulted in a way to adopt your very own baby SuperServer Workstation. Starting today, we're taking the blankets off this efficient and surprisingly powerful little guy, and orders are now being taken. You, the TinkerTry home lab enthusiast, can now get a TinkerTry-designed, Wiredzone-assembled-and-tested Windows 10 Pro system, with 64GB of glorious DDR4 RAM, able to grow to 128GB. Born to you at 15 pounds 0 ounces, with a bare OS on that Samsung 850 EVO SSD, dressed up with only the proper drivers. 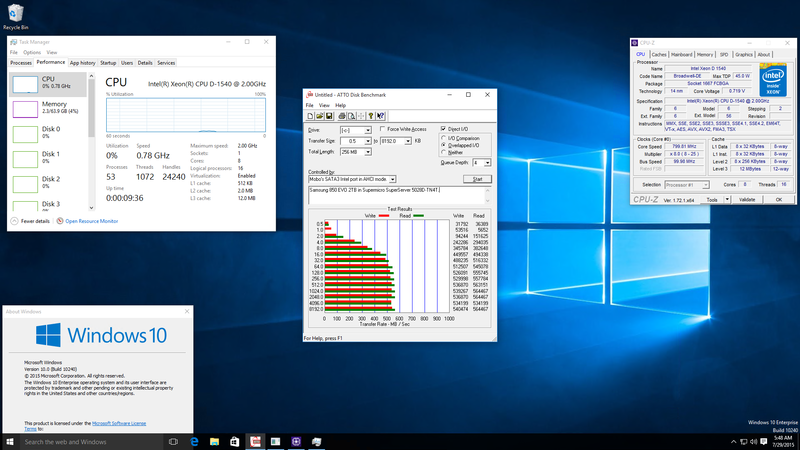 Windows 10 Pro just finished running a Samsung 850 EVO ATTO Disk Benchmark speed test. Note 0.78 GHz, as the idle CPU has smartly chosen to enter a low-power-use state [click the image 2x for a much closer view]. This is hands-down the best home server I've imagined, much less owned. I've tinkered with a lot of gear these past 25 years in IT, including hundreds of servers/blades/racks, and several PCs towers and rack-mount servers at home, having to turn it all off when not in active use. Even with all that time enjoyed with a variety of enterprise and consumer class gear, I'm still rather stoked about this little champ. Yeah, it's that good. For me, it strikes just the right balance between enterprise and consumer. Pairing an 6-drive-capable mini-tower case with Intel's nifty Xeon D-1540 SoC (System on a Chip) gives you the benefits of a powerful-yet-efficient motherboard design, with massive expansion capability. Under your care, it's ready to grow up quickly, easily adapting to its environment. I'm actually in the midst of replacing a laptop in my office this weekend AND an old virtualization vZilla in the basement. The plan to use just this SuperServer 95% of the time has been piloted successfully for weeks now, with the little baby located in another room, a good 20' from my productivity-worker triple-monitor setup, using my special extender kit. Less noise where I work, and much less of that gradual heat gain I really feel when working for hours, or rendering videos. I'm now getting more done, with a lot less gear, at roughly 1/3rd the overall electricity usage if we include the 3 LED-backlit monitors (24"/27"/24"), 1/5th if we don't. I'm working to measure each item's watt burn more accurately, before I break things down and re-purpose the gear that I'm putting into occasional-use-only mode. This 8 compute core beast is born to you with 2 32GB memory sticks on board, with room for 2 more, for a total of 128GB of RAM. Holy guacamole! Finally, my 4 years of ramblings about 32GB RAM restrictions are behind me. The preloaded Windows 10 Pro and that VisionTek GPU is capable of driving a triple 4K monitor rig and can handle AMD Eyefinity. Maybe not for gaming really, but certainly very nice for getting work done. Comes with a mini DisplayPort to DisplayPort adapter, and a HDMI to DVI-D Flex Adapter. It can start life as your workstation, but adapt to become your complete home server too (vSphere 6 or other). All in one system, with both roles filled beautifully, concurrently. 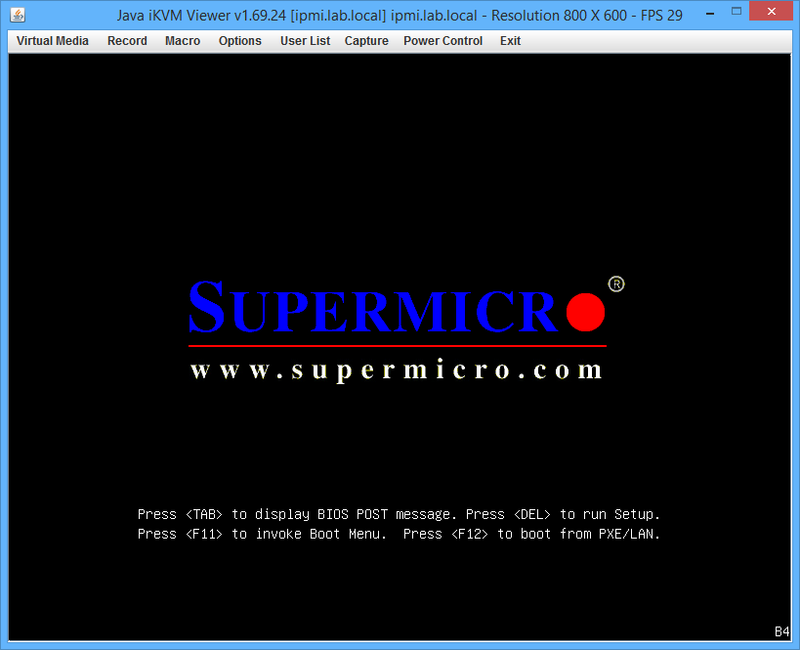 iKVM is a beloved Supermicro signature feature, allowing you to not only power up and down remotely, but giving you complete remote control too, even from your phone using IPMIView. I may just take the included Windows 10 Pro SSD on the road with me to boot in my occasional-use laptop, leaving the home server behind to fulfill its 24x7 duties (VPN gateway, daily family PC backups with Veeam, iOS print server, Plex Server, Windows Server 2012 R2 Essentials, OS/2, etc.). Some alternatives you may be considering include stick with just Windows 10, where you could use Storage Spaces to tie those drives together. Or you could use the built-in RST (Intel Rapid Storage Technology) RAID0/1/5 abilities that works on conjunction with the Windows-only drivers (not VMware supported). Finally, this SuperServer could make one helluva FreeNAS or openfiler box. Physical, of course. 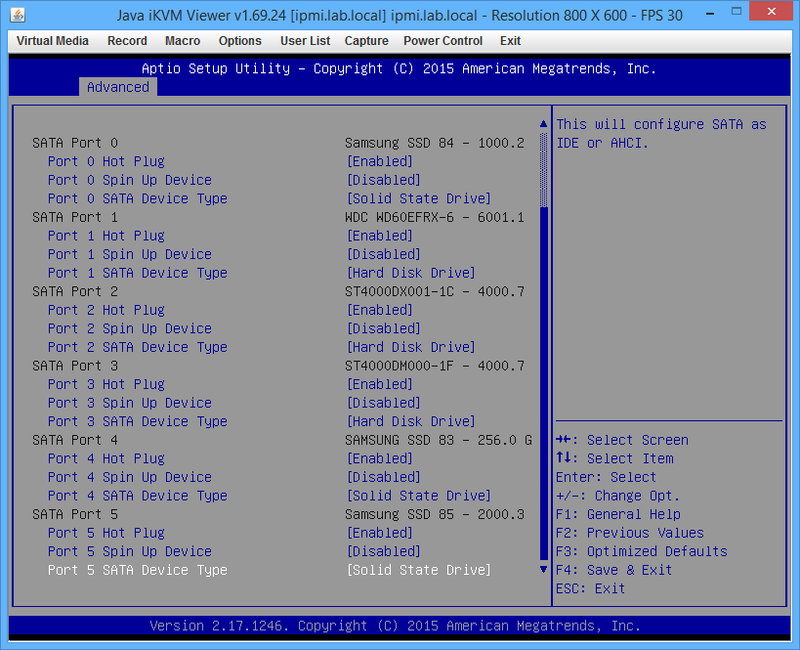 Or even virtual, using RDM mappings to pass those 4 3.5" drives right through. You could also go with up to 6 2.5" drives if you get 4 3.5" to 2.5" adapter caddies. Tons or RAM for cache. I realize that's insane overkill. For my home office needs, this single server fits the bill quite nicely. While the cost is higher than your typical 32GB of RAM PC, I already know I need way more than that, to take over everything my two Core i7 systems (tZilla at 16GB of RAM and vZilla at 32GB of RAM) for any chance at this consolidation and energy savings project to succeed. I've taught my little SuperServer Workstation to be a full-blown VMware vSphere 6.0 home virtualization lab, while still keeping that same Windows 10 Pro Workstation running. You read that right. Yes, you can have both running concurrently, and TinkerTry articles already exist to help you do the same, if you get this same exact server, simply passing that SSD and GPU right through to that pretty special little VM (VT-d/VMDirectPath/pass-through). These new generation Xeon D-1540 systems only started getting reviewed in March 2015, and shipped to real people in late June 2015. So the preparation for me involved nailing down the Windows 10 install process and the ESXi 6.0 install process, doing a LOT of Windows 10 and ESXi 6.0 testing and re-testing. Followed by a major re-swizzling of the parts. Ending with some simple last-minute tweaks once Windows 10 actually arrived, and making sure the items were ready to be included with this pre-assembled and tested solution. Despite Windows 10's newness, there have been no burps since its release. Why I chose to team up with Wiredzone? We build customized rack, stack, and cabling integrated into custom enclosures for education, research, and business organizations. Our engineers configure every server assembly, including virtualized servers, based upon your specific needs, resources, and applications. 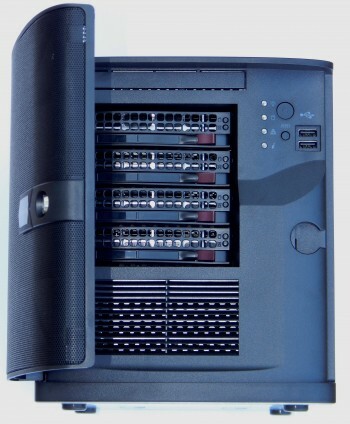 Supermicro SuperServer mini-tower ordered with 64GB of memory, the ultimate home virtualization lab? 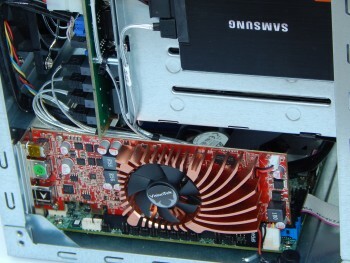 Video card clearances seen here, with a second Samsung SSD shown in the side-bay, and that 6th SATA cable that only Wiredzone includes. Click image for a closer look. It quickly became obvious that there are other perks with ordering through a reseller, including great customer service, with actual humans reviewing your order carefully. Then there's the willingness of Bruno Felix, Founder & CEO of Wiredzone.com, Inc., to work me at TinkerTry.com, LLC, collaboratively creating a new SKU and build procedure together, for Wiredzone to efficiently assemble and test this custom build prior to shipment. I kind of doubt it's this easy to create a custom HP, Dell, or Lenovo server bundles. The Authorized Reseller system works well. We just needed to be sure the bundle works very well with both Windows 10 and with VMware vSphere 6.0.0b, in case you upgrade in the future. Windows 2012 R2 / Hyper-V is also fully supported by Supermicro for this system, but I have not had a chance to test those yet, given I'll be nesting Hyper-V anyway. Very special bundle of joy arrives by ground or air (stork?) with valuable added features and no crap. Includes the CSE-721TQ-250B chassis/power supply, and the Super X10SDV-TLN4F motherboard. These will work, and are certified for use in this system, called MEM-DR432L-SL01-ER24 by Supermicro. This slender card fits in nicely, and works well with Windows 10, natively or as a pass through VMware VM (using PCI Hole). We are working to address the drop down description at Wiredzone, but I can assure you that this will be the exact drive that's included, with Samsung's full 5 year warranty. You can choose other sizes of 850 EVO too, and they all share the same firmware. The price is intended to be low, knowing you might already have a drive you wish to clone this Windows 10 build right over to, freeing the bay up for that Samsung 850 EVO 2TB SSD you might get, some day. The 2TB SSD is the one I went with, for the long haul. I don't completely rebuild very often, and all sizes of the EVO 850 share the same behavior/speed/firmware. Valuable convenience items, saving you time, money, and effort, ONLY available with this bundle. Wiredzone will add the matching 6th short and slender silver SATA3 cable that Supermicro should have included in the first place, for that 2nd side-mounted 2.5" SSD bay. Wiredzone will include this free, still in the original packaging, in case you want to use it for ESXi 6.0 at some point later on. 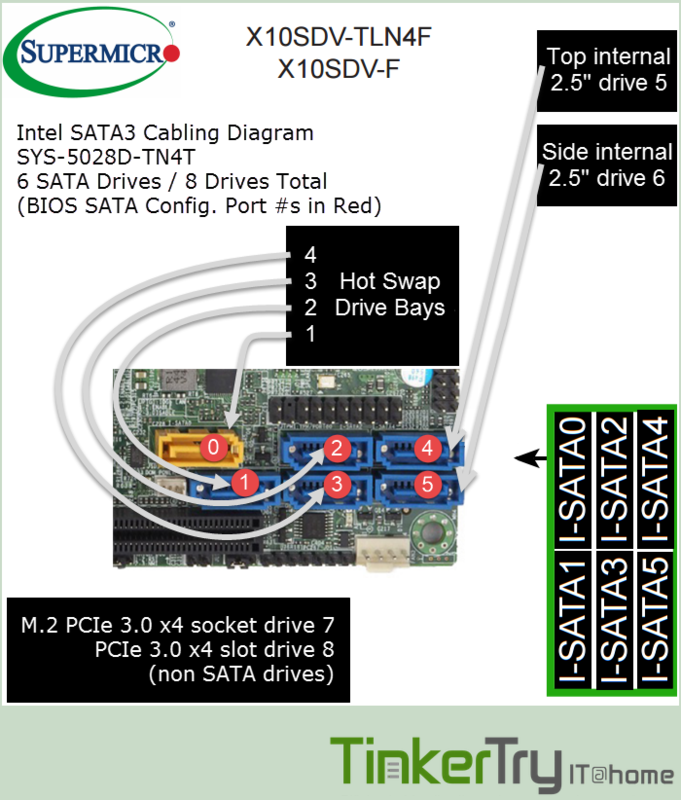 This way, all your SATA3 ports and drives stay available for better uses, with ESXi Hypervisor itself being rather tiny and largely read-only once booted, running your Hypervisor at full speed. Wiredzone will be providing the little speaker that Supermicro should have included in the first place. Great if you want to be able to hear POST beep codes, and to be gently cued to hit Del to get into your BIOS, without having to hover over the keyboard waiting nearly a minute for that moment. Of course, you can also remove this speaker. For the Bundle 3 model, you'll need to install the speaker yourself. Two TinkerTry stickers will arrive in the box, for you to use however you feel fit, with that extra thrown in for your Commodore VIC-20. Wiredzone can also ship internationally. If you make sure you use any of the unique TinkerTry Affiliate links on this site, then the shipping is automatic, saving you a lot compared to piecing this together yourself. It can take up to 10 business days to receive your system here in the US, but most will get their orders in less than a week. This time interval might be reduced considerably in the future, including overseas assembly and shipments (Oct 30 2015 update - shipping from The Netherlands is now available!). There are optional expedited and world-wide shipping options available too, with everything in one box shipped directly from Wiredzone near Miami, Florida. To my surprise, I learned yesterday that Wiredzone also uses Passmark BurnInTest as part of their standard 4+ hour burn-in procedure. Isn't that exactly what I ran (see sample results Log and certificate and results) when I received one of the first of these SYS-5028D-TN4T's available in late June? Helping to give me peace of mind that my CPU and GPU and system continued to run well through it all, while keeping their cool. The GPU fan only increased RPMs slightly. More details and pics in the comments below. See also representative sample of the PassMark PerformanceTest 8.0 Results Graphs. The required assembly and testing does add $50 to the bundle price, but it greatly reduces the risk of a dead-on-arrival component arriving at your doorstep. Let Wiredzone install Windows 10, and discover any issues up front, rather than you having to deal with them afterward, along with the shipping time and cost of sending it back. 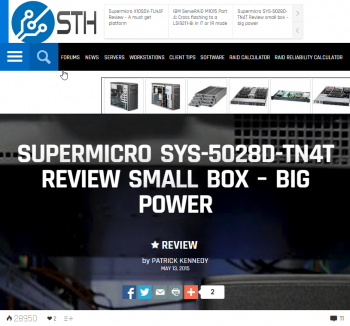 The way Supermicro packages their gear, your unboxing experience won't be adversely affected, only improved. More stuff in there already, and much less for you to have to do (plug it in) before you can boot your fresh Windows 10 Pro off SSD. See also TinkerTry unboxing and assembly videos. Q: Who handles the hardware warranty? A: Wiredzone handles the first 30 days. Supermicro's 24-Hour SuperServer Technical Support handles the rest, 1 year for parts, 3 years for labor, details here. For the 3rd party products, the warranty is handled by the respective companies, with a 5 year Samsung warranty on the EVO Pro SSD, for example. Q: What's the Wiredzone tamper sticker on the back about? We came up with the sticker to protect us regarding our assembly service. A few customers have wanted us to troubleshoot the system for them after they had made changes, such as add a PCI card or non-qualified M.2 SSD. Once the sticker is broken the customer has to troubleshoot themselves and contact us to replace only the defective component (if applicable and if purchased from us). When the sticker is intact we simply ask the customer to return the whole unit for us to troubleshoot or we help over the phone. Although it may seem restrictive, it's the best way we found to optimize the time we spend with tech support calls. Customers are free to break the sticker for upgrades if they desire, all warranty on hardware remains the same, but we wouldn't spend time helping with configuration issues." 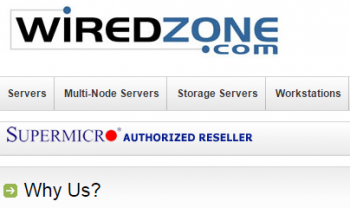 Q: What is Wiredzone's return policy for these SuperServer bundles? Customer has 30 days to return the bundle system for refund or credit. After 30 days we can only do repair/replacement of any defective component. The bundle comes with 1-year warranty, although the CPU, memory and SSD have longer warranties. Extended warranty is available for up to 5-years, in case any customer is interested. This includes overnight cross-ship replacement of any defective component. Q: How about Windows 10 support? A: OEM Windows versions have no reseller support, so you'll need to contact Microsoft Support. TinkerTry's unoffical build procedure is simply using Supermicro's latest drivers, is stable, and works very well, with no yellow warning "bangs" in Device Manager. A: Their pricing is fair and competitive. Market prices for the components are subject to change at any time, which means the bundle price may change at any time. with other bundling resellers charging much more for add-ons like memory or disk. Wiredzone let's you add a 6TB drive at the same cost as if you were to buy it separate from them, so why not stick it all in one order, saving you shipping fees. Q: What about that 2.0GHz/2.6GHz, is the SuperServer Workstation powerful? This octacore Xeon is designed for heavy server, storage, and workstation workloads, along with virtualization of course. This Xeon gets more work done per clock cycle than consumer CPUs like Broadwell and Skylake, and can boost a stressed core quickly up to 2.6GHz, when needed. This design raises the overall efficiency and performance of this solution. 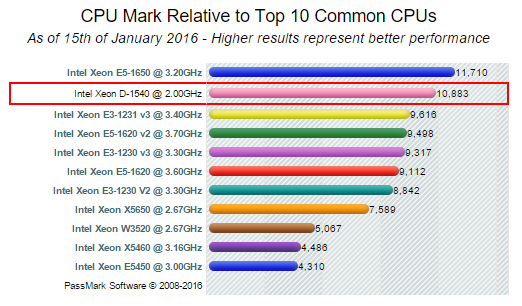 See also this helpful Core i7 v Xeon D-1540 table at CPUBoss Review, and the whole story at Intel Crafts Broadwell Xeon D For Hyperscale. For my needs, I'm largely replacing my 4 1/3 year old Sandy Bridge Core i7 2600 with 4 cores. This Xeon is simply able to juggle many more VMs, since there's more compute cores to go around, and burns roughly half the watts. You also don't want or need a consumer Core i7's built-in GPU for ESXi. A server CPU is a good match for ESXi's headless design. You may also enjoy reading many more of the TinkerTry articles listed below, as you do your "homework." SuperServer's Xeon D-1540 at left, vZilla's Sandybridge at middle, and the high-end Skylake at right. Yep, it's not all about the GHz. 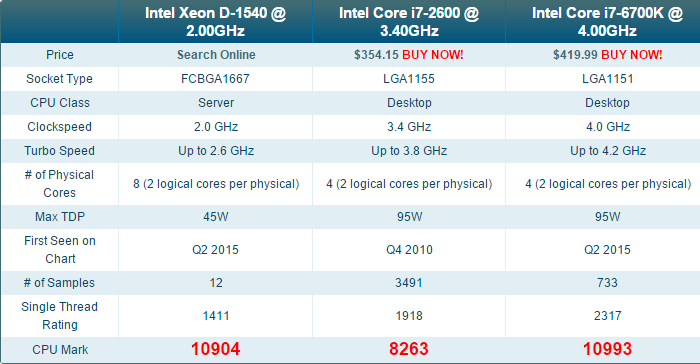 Finally, there's Intel ARK detailed comparison between Xeon D-1540, D-1541, and Core i7-6700K (Skylake). Q: How efficient is the SuperServer Workstation? A: Even when filled with a GPU and 4 spinning 3.5" drives, even under heavy load, this unit sees maybe 125 watts maximum during my informal tests, worst case. But 99% of the time, you'll be more likely to see about 50 to 80 watts. Depends on the workload and the number of drives too, of course. See also my short boot-up videos that show watt burn, Windows 8.1 and ESXi 6.0. This new chipset is smart enough to automatically limit watt burn when idling,so you can leave it on 24x7 with less guilt and cost. In Windows 10 for exampe, Task Manager will show the CPU at 0.78 GHz, when idle. Under ESXi, your VMs will indicate they're running at 2.0 GHz, always ready for you to take them out for a spin, instantly. Q: Is the SuperServer Workstation good for productivity workers looking for a very capable Windows 10 Pro workstation, with triple monitor connections (2 HDMI, 1 Mini DisplayPort)? Q: Nothing is perfect, what do you wish were different about this system? A: No "sad trombone" moments here, where I'd be concerned about openly admitting I really like this system. No serious reservations. It's most just minor constructive nit-picking, listed at TinkerTry here. With the Bundle 1 added VisionTek's fan always running at a bit high RPM even when idle, the SuperServer Workstation isn't quite as quiet as I had hoped, but I found I could mitigate the 125Hz sound quite a bit with Dynamat and some foil tape (that I already had), to keep the Dynamat edges tidy, pictured below. You can also eliminate possible noise concern by not using the GPU and putting the SuperServer in a basement or other distant area as a server only, since you can use iKVM for remote power cycling and remote keyboard/video/mouse. For me, I chose to use all 3 GPU outputs, while moving the SuperServer to the next room over, away from my triple-monitor work area. I was able to do this by using my 20' extension kit. I'm still cooking up some ideas for measuring SuperServer's dB output for you, and potentially more ways to reduce them dBs right at the source. Stay tuned. I'm pretty picky about sound, and typical Xeon Servers tend to be WAY louder than this. I personally find the SuperServer Workstation to be considerably less obtrusive than a Mac Mini's tiny fan when under heavy load, for example. The sound is pretty much the same all the time, with small variations in fan RPMs barely noticeable when under load. All components run cool to the touch, whether the PC cover is on or off. Remarkable chipset and design. "Our current released X10SDV-TLN4F motherboard and related server SKUs using this motherboard based on D-1540 CPU does not have SR-IOV feature." Works great for PCIe slot devices, such as my Visiontek AMD GPU/Graphics Card in the SuperServer Workstation Bundle 1. But VT-d won't work for some of the other chips on the SoC (System-on-a-Chip) SATA ports, since it also passes the USB ports through to the VMs. That may or may not be an issue for you, and there are workarounds, see also discussion here. Despite there being many other Supermicro systems on the VMware Hardware Compatibility list, somehow, this SYS-5028D-TN4T isn't one of them. I comment Supermicro's honest with their compatibility table at their site here, temporarily taking the 5028D-TN4T off the support matrix until the 10GbE driver could be downloaded. That matrix should be updated very soon. I have been in direct contact with Supermicro about both of these issues, and their importance. Meanwhile, know that this system works great, complete with system monitoring like fan speeds and temperatures, with no special downloads or drivers needed. ESXi 6.0 just works, and if you want 10GbE, you're all set there now too, explained and tested here at TinkerTry. Q: Is the SuperServer Workstation great for virtualization enthusiasts and IT professionals already familiar with earlier versions of VMware vSphere? A: Hell yes! And you get a nearly-free Windows 10 Pro workstation thrown in, I'll be blogging soon about the details of using this device to get that working very nicely. Subscribing to TinkerTry Weekly will help to keep you informed of all new articles. 9.45" High by 8.27" Wide by 11" Deep. Q: Is this SuperServer Workstation great for total virtualization newbies, looking to learn from scratch? 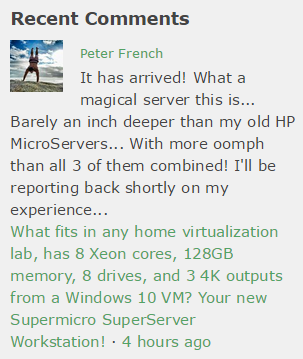 Honestly, the SuperServer Workstation is more suited for enthusiasts who are ready to get serious about VMware. With plenty of RAM to allow nesting of ESXi vSANs, or even Hyper-V.
That said, the hardware works very well, and the install is easy. 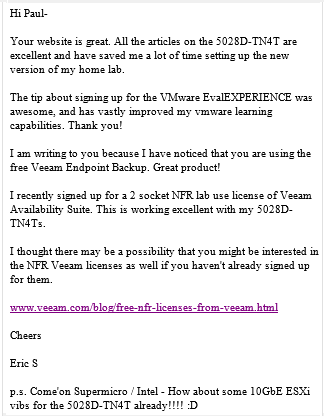 If those new to VMware vSphere are willing to invest in this system, they would also have to be willing to put in the time to learn from TinkerTry's writings, and see the dozens of links at the end of this article. TinkerTry cannot be a substitute for the self-training effort that would be required of you. You also need to be very serious about your IT career. 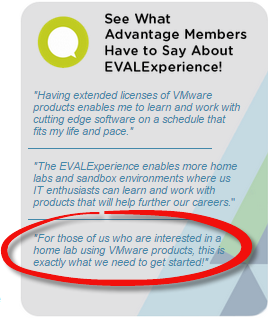 If that career involves VMware vSphere, this would be a great way to get started, with a whole lot of practical benefit to your home network too. Q: How would virtualization enthusiasts use all that RAM? A: VMware Workstation (or Player), Oracle VirtualBox, Citrix XenServer, Microsoft Hyper-V, and VMware ESXi 6.0 can really help you get the most of this server's vast memory capabilities. My day job has included VMware vSphere for over a decade, and staying certified this whole time was my own responsibility. No better way to learn than by doing, then teaching. See also the TinkerTry YouTube Channel, with this very popular video. Q: When will Supermicro support the 10GbE ports for ESXi 6.0? A: Supermicro support is very aware of this issue, I have communicated with them directly. Partly based on my feedback, they quickly fixed their website at product launch in late June, to reflect that the 10GbE VIB (driver bundle) is not yet available for ESXi 6.0 owners. All other components, including health monitoring, work great out-of-the-box with ESXi 6.0. Supermicro expects this issue to be resolved by Intel soon. TinkerTry Tip: For now, you can use both 2 1GbE ports and 2 10GbE ports with Windows, and with ESXi 6.0, you can use 2 1GbE ports, and pass the 2 10GbE ports through to the Windows 10 VM. Nice! Nov 04 2015 Update: Fixed! TinkerTry tested 10GbE driver here. 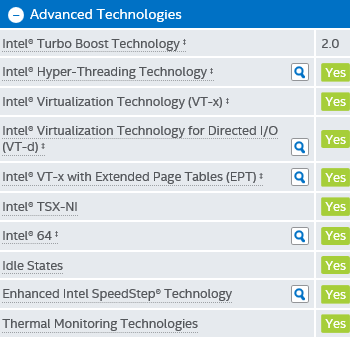 Xeon D-1540 Advanced Virtualization Features including VT-x and VT-d.
Q: What special virtualization features are there in this SuperServer Workstation? A: The SuperServer Workstation has all the high end datacenter features like 2 10GbE ports and 2 1GbE ports, and CPU/chipset features like VT-d (VMDirectPath). This pass through ability allows this same system to run your Windows 10 as an ESXi 6.0 VM, with the GPU and SSD both passed through. You get an amazing workstation, and the ability to juggle many more OSs securely, all in one system, explained at TinkerTry here. Another other special feature is the ability to go way past the 32GB of RAM that most systems are stuck at in 2015, which really holds today's users from running more than just a few low RAM usage VMs. A: This is the only 32GB DIMM that Supermicro has tested, and the SuperServer Workstation normally doesn't come with memory. The price Wiredzone is charging for these 2 DIMMs is very competitive with Newegg and Amazon. With 4 DIMM sockets, you don't lose any of your investment, should you get 2 more of these same 32GB DDR4 DIMMs in the future. This bundle is intended to have enough grunt to enjoy for years to come, and the ability to grow into a virtualization platform, without losing any of this sizable investment. Lower end systems with regular size DIMMs are found elsewhere. Q: How do I upgrade this to a vSphere 6.0 SuperServer, while keeping my existing Windows 10? A: These details are discussed here, or jump right to the build-steps, with more information at TinkerTry giving more details soon. Q: How do I get VMware vSphere 6.0 licenses and support? A: If you want to upgrade this vSphere 6 ready bundle, you will need to secure your own copy of vSphere 6.0, with EVALExperience being a great way to get 365 days license for $200. Note, there is no official support at this level, and it's not intended for production workloads. You may be able to contact VMware Support directly for paid support options. Q: What about VMware ESXi 5.5 support? A: No, not on Supermicro's list for this modern chipset server, with an eye toward the future, not the past. It probably works great with it, though, just not something I've tested. Even the 10GbE driver lists 5.5 support. Q: Why the specific set of carefully chosen components? A: VMware vSphere 6 is definitely a data-center friendly product, and was never intended to run on just any old consumer gear, even though many of us have spent years trying. Let's face it, many Realtek NICs are pretty lousy when it comes to using them for ESXi. Also, VT-d can be picky about GPU type. This particular VisionTek works without issue on ESXi 6.0, passing that GPU right through to your Windows 10 Pro SSD. With ESXi 6.0, if we stick with gear that's on the VMware Compatibility list, things go well, and install easily. I've found it nearly impossible to offer advice to folks who own gear different than mine, even in an informal capacity. Another reason I'm excited to finally be standardizing on something that's pre-assembled. The home-builder's dream, something that matches what I would have built anyway, without the thermal paste. Q: What if I want to choose my own system components? A: Yes, you can do that of course, the bare system is available with no memory or disk or options at Wiredzone, with no commission for TinkerTry. If you add all the same components as the bundle, you'll come up with the same price, minus the extras that only the bundle has, and minus the free shipping. Also note that you will be less likely to be able to get help with issues that may crop up, since we're less likely to have common hardware to discuss. Excellent question. This little server is normally intended for headless use in a datacenter, with a very handy Web UI to kick off the Java app that lets' you do keyboard/monitor/mouse and even media mounting remotely. Local users only get VGA output. It can easily become a great workstation though. The big benefit of this slender GPU is that it can run Window 10 with up to three 4K monitors (1 Mini DisplayPort, 2 HDMI). Not all brands and styles of GPU allow that special ability. and is low enough on power usage to ensure we keep the 250 watt power supply happy. Also works well booted to Windows 10 natively, or as a VM. None of VisionTek's other gear https://www.visiontek.com/graphics-cards/enterprise-graphics-cards.html or competors cards (NVIDIA included) seemed to offer such a capable and compatible card. Thank you for making my article better by asking a question I didn't adequately anticipate. I guess my article just wasn't long enough. I've now added this Q&A to the article above now too. Q: Can I upgrade the GPU? See also the closely related TinkerTry comment. Q: What about 230/240V Power? Q: Can I upgrade the CPU? A: No. SoC means the CPU is soldered on motherboard, with cooling fan included. Intel warned us years ago things were headed this way. The efficiency gains are worth it. Q: What do I need to know about storage, and should I buy new drives, or re-use drives I already have? 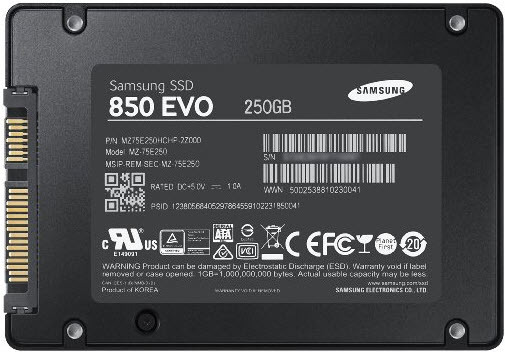 A: The server will arrive with a Samsung 850 EVO in the top inside 2.5" drive bay. Do what you want with the other drive bays, and/or the M.2 port (that can be adapted for mSATA). Let's next take a look at the exactly how Intel chose to have those 6 full 6GBps Intel SATA3 ports behave. Front SATA connector of the motherboard schematic, found on Page 1-4 of the X10SDV-TLN4F User's Manual, with cabling overlays added by Paul Braren from TinkerTry. Here's a representative look at the SATA devices as seen in the BIOS. You can get up to four of these optional 3.5" to 2.5" converter caddy units (SKU 10019224) to convert any of the 4 hot swap bays from 3.5" spinning drives to 2.5" drives (spinning, or SSD). 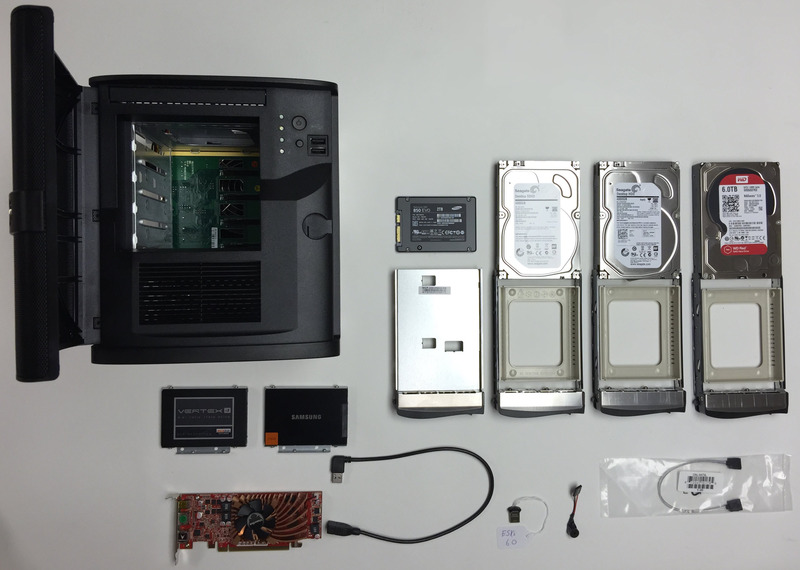 You can have up to 8 storage devices! Sep 26 2015 Update - You can actually have a 7th and 8th drive, if one is NVNe using the PCIe slot, and other other is M.2 (which is not SATA, and uses either AHCI or NVMe). I discovered all of this first-hand, see new M.2 and NVMe articles. There is one M.2 (NGFF) port on the motherboard that works like this. SATA0 is the yellow SATA DOM port on the board. If you buy a SATA DOM Module, it takes over that SATA0 port, so you'll need to move that SATA cable to another available port, if you want the use of all 4 hot swap drive bays. What if you have an AHCI device installed in the M.2 socket, such as the M.2 Samsung SM951, or any mSATA drive using an M.2 adapter like this? Well, turns out that AHCI device takes over as SATA0 in the BIOS, since the M.2 slot is muxed (shared) with that that SATA0 port. Whatever is plugged into that yellow SATA0 port is now ignored, such as an optional SATA DOM module, or whatever is at the other end of the SATA3 cable. Good news, for those using M.2 NVMe devices like the Samsung 950 Pro. It's not AHCI/SATA3 at all, and it won't show in the list of SATA devices. This is good because it means that you now have full use of all 6 of your Intel SATA3 ports for other drives, and this system's BIOS lets you boot from NVMe, whether it's in the M.2 slot, or in the PCIe slot using an adapter, or a PCIe device like the Intel 750 Series. Nice! Yes, VMware, hard drives, and backup software, and Windows Server and Workstation tips have been mainstays here at TinkerTry these past 4 years. Q: Does TinkerTry offer free support? A: You could argue yes, if you look at the hundreds of articles, and thousands of answers to Disqus questions below them, over the past 4 years of TinkerTry growth. But it's pretty much best-effort free-will answers, for things I can answer. What I can say for sure is that the odds are A LOT BETTER that I can try to help you if you bought from Wiredzone so you have the same gear, with the same BIOS level and settings and firmware levels. If we get beyond something that I can answer off the top of my head, there's always one-on-one consulting to consider. On the fence about trusting TinkerTry? See also TinkerTry.com/testimonials. Feel free to drop pre-sales questions below this post, no name or login required. Let's avoid email (which I cannot possibly keep on top of), and help each other, and everybody else, at once. It's likely others are wondering the same thing you're thinking of asking. C'mon, be the one-in-two-thousand visitors that bother to ask. Don't be shy! There's also The Home Server Show SuperServer 5028D-TN4T forum for you to consider perusing, better yet, using. This is a SuperServer/Workstation combination that I can very comfortably recommend, with a price point that's a lot more realistic than buying from those bigger companies that are more focused on 24x7 support than energy savings. Drop your comments below, or over in the special forum that friends at the Home Server Show created, just for this little SuperServer 5028D-TN4T. New Bundles now available, ordered here. Here's the "legacy" shopping cart from Aug 1 to Oct 29, confusing some buyers, with some regretting choosing 16GB DIMMs. Now, all the components are in one bundled price, add your own stuff to the bare-bones build, whenever you'd like. If you want to move from the included 64GB of memory up to 128GB, just add 2 of these to your cart before you complete your Bundle purchase. This way, all 4 of your Samsung RDIMMs will match, and be burn-in tested together. These are ECC Registered DIMMs, the only type Supermicro validated. You can only add memory to this system in matching pairs, and the memory pricing at Wiredzone is very competitive. You can also add 2 more identical RDIMMs later as the need arises. Prices might fall a bit more, and they should be available for quite a while, since DDR4 in this density is quite new.